The toughest people on your Christmas list—it’s always the atheists, right? You can give a Jesus Dressup refrigerator magnet. Or a Darwin Fish car sticker. Or a Buddy Christ dashboard statue. But let me suggest something that’s a little more intellectual. 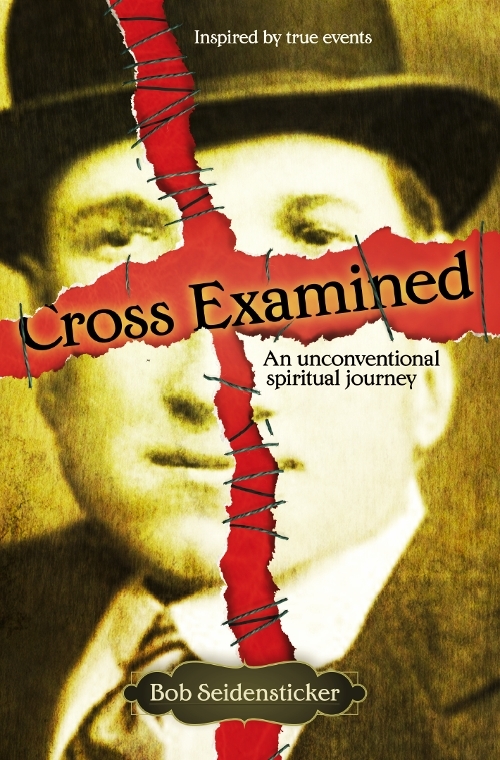 My new book, Cross Examined: An Unconventional Spiritual Journey is now available at Amazon. I wrote my first notes about this project over eight years ago, so I’m pretty excited to finally be able to share it with you. While many books defend the atheist position, this book takes a fictional approach to tough counter-apologetics arguments. Indeed, the intellectual debate nearly becomes another character within the story. The book targets two audiences. First, I want to give thoughtful Christians something to think about and to encourage complacent Christians to critique the foundations of their religion. Many Christian leaders make exactly this point, that they too want to push Christians to think. I think of the book as an intellectual workout—a taxing project, perhaps, but one that leaves the reader a stronger person. Second, I want to reach atheists who might enjoy approaching these intellectual arguments in fiction rather than in the usual nonfiction form. In 1906, three men share a destiny forged by a prophecy of destruction. That prophecy comes true with staggering force with the San Francisco earthquake and fire, and young assistant pastor Paul Winston is cast into spiritual darkness when his fiancée is among the dead. Soon Paul finds himself torn between two powerful mentors: the charismatic pastor who rescued him from the street and an eccentric atheist who gradually undercuts Christianity’s intellectual foundation. As he grapples with the shock to love and faith, Paul’s past haunts him. He struggles to retain his faith, the redemptive lifesaver that keeps him afloat in a sea of guilt. But the belief that once saved him now threatens to destroy the man he is becoming. Paul discovers that redemption comes in many forms. A miracle of life. A fall from grace. A friend resurrected. A secret discovered. And maybe, a new path taken. He realizes that religion is too important to let someone else decide it for him. The choice in the end is his—will it be one he can live with? Cross Examined challenges the popular intellectual arguments for Christianity and invites the reader to shore them up … or discard them. Take the journey and see where it leads you. Buy copies for those hard-to-buy-for friends who would enjoy a different approach to the Christian/atheist debate. It’s guaranteed to be far more intellectually stimulating than a refrigerator magnet or a Buddy Christ dashboard statue (and less cliché than frankincense or myrrh). Thanks! This entry was posted in Atheism, Christianity and tagged Apologetics, Azusa Street Church, Book, Buddy Christ, Christmas Gifts, Counter-apologetics, Cross Examined Book, Darwin Fish, Fiction, Jesus Dressup, Paul Winston, Prophecy, San Francisco Earthquake and Fire in 1906 by Bob Seidensticker. Bookmark the permalink. Not a bad start, admittedly. But what Christmas tree will seem appropriately festive without a copy of my book underneath?? Interesting title. When I think of spirit or spiritual I think of a soul, or some kind of entity that is within humans that is invisible. I guess I really don’t know what spiritual means, so I will look it up. I don’t believe in a spirit. I believe spiritual is just another word for an emotion, or feeling. I hear people use the word spirit, soul, and I just think to myself there is no proof of such things, therefore, they do not exist. and the link is at?????? I’ll post the link tonight. The book doesn’t go live until Thursday. Thanks, Matt. Come back tomorrow and buy early and often! I just figured I would search for it on Amazon tomorrow, but will look for the link tonight. When is it going to be available for Kindle?